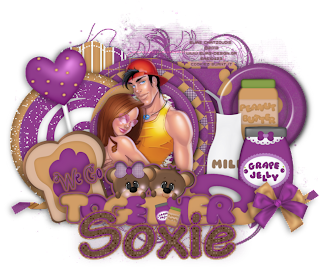 The awesome Soxsational Scraps has recently come out with a jiving Peanut butter and jelly loving kit. It's a jamed packed with pb and j fun, with lots of her cute and cuddly bears in it. Why not go purchase it at her stores today? Here's what I created from her jiving kit. Plus a tutorial for you. Open your TW-PJ-Paper5, C/P into the last layer of your template. From there there choose any mask you want or choose the one i used with a rectangular pattern. Now open your TW-PJ-Papers, choose any papers you like, C/P them each over the shapes of your template. Open your TW-PJ-Paper1 Copy and paste it over the last square of the template, and paste over that, next you will want to grab your magic wand tool, click on your circle that's a part of the template, press Ctrl+Shift+I on your keyboard, this will allow you to invert. Next click the layer TW-PJ-Paper1, and hit your delete key. Do this same step for all your layered shapes of your template. Next open TW-PJ-33, and add your drop shadow settings, re-size to 50%, and C/P over the squares on there right side. Next open TW-PJ-04, add your drop shadow settings, re-size to 40%, and C/P over TW-PJ-33. Next open TW-PJ-09, add your drop shadow settings, re-size to 60%, and C/P over TW-PJ-04. Next open TW-PJ-02, add your drop shadow settings, re-size to 45%, and C/P next to TW-PJ-09. Open TW-PJ-39, add your drop shadow settings, re-size to 50%, and C/P next to TW-PJ-02, and using your move tool tilt your donut down on the right side. Next open TW-PJ-21 and TW-PJ-22 add your drop shadow settings, re size to 20%, and C/P under TW-PJ-02, and over you donut. Open TW-PJ-49, add your drop shadow settings, re size to 80%, and C/P behind the very first circle of your template, like how I have done mine. Open TW-PJ-45, add your drop shadow settings, and C/P over TW-PJ-49 . At this point open your favorite couples tube. Re-size it using your move tool so it fit in the center of your signature and add your drop shadow. Open TW-PJ-10, add your drop shadow settings, re-size to 50%, and C/P over TW-PJ-45 and using your move tool tilt your toast to the left down. Next open TW-PJ-14, add your drop shadow settings, re-size to 80%, and C/P on top over your tube, and donut and toast, just like how I've done mine. Next Open TW-PJ-26, add your drop shadow settings, C/P behind your word art. And your done. Here's what I've also made from Soxie PB and J kit. Perfect condiment for a Facebook timeline cover.